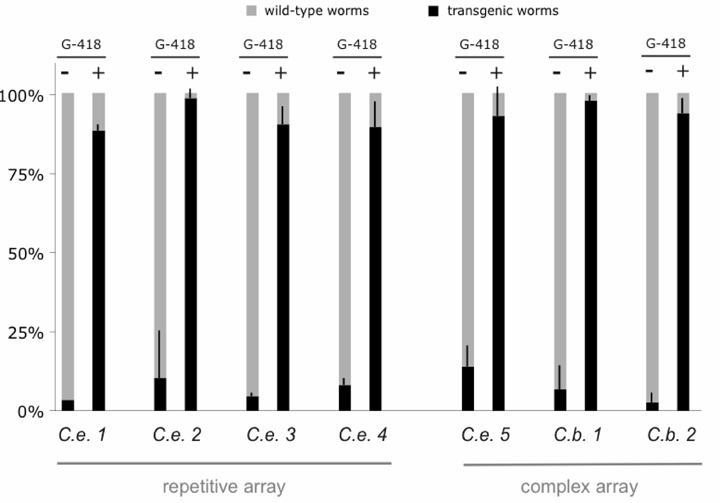 C. elegans transgenes are usually maintained as unstable extrachromosomal arrays, requiring the manual picking of animals using visible markers. This can be laborious and limiting for some assays. To overcome these shortcomings, our two groups independently developed methods for using antibiotic selection in C. elegans. We developed nematode transformation vectors carrying antibiotic resistance genes (Neomycin and Puromycin, respectively) and found that they could be used as very efficient selection markers. Selection can be performed in both liquid media and on agar plates, and has no obvious effect on phenotype. The two selection systems allow hands-off maintenance and enrichment of non-integrated transgenic animals, as well as isolation of MosSCI-generated single copy integrants. No particular genetic background is needed and both selection protocols also work in C. briggsae. We hope therefore that the approach will be useful to many worm biologists, including those working on species other than C. elegans. To our knowledge this is the first time that antibiotic resistance markers have been successfully used in whole animals, and so the approach may open up opportunities for research using other ‘non-model’ organisms. Figure 1: Hands-off enrichment of neomycin-resistant transgenic animals on G-418-NGM plates. For four C. elegans repetitive array lines (C.e. 1 to 4) and 3 complex array lines C. e. 5 and C. briggsae (C.b.) 1 and 2, the proportion of GFP positive is measured, using COPAS, after expansion from three transgenic adults, for ~5,000 animals excluding L1 that can be arrested non-resistant animals. 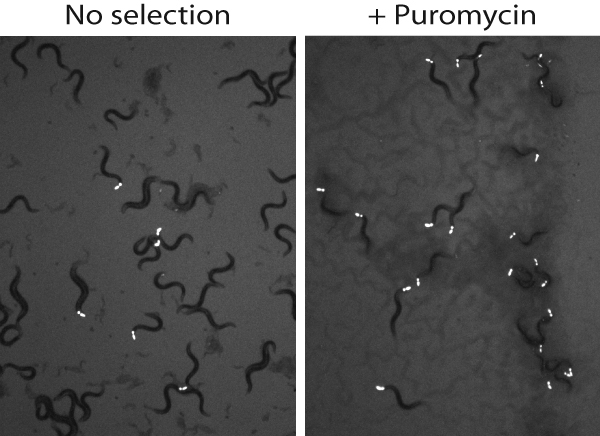 Figure 2: C. elegans L1 larvae carrying an extrachromosomal array with the puromycin resistance gene and a Pmyo-2::mCherry pharyngeal marker were cultured in liquid NGM in the absence (left) or presence (right) of puromycin. After 4 days the worms were plated on non-selective seeded NGM plates and the surviving worms photographed two days later.